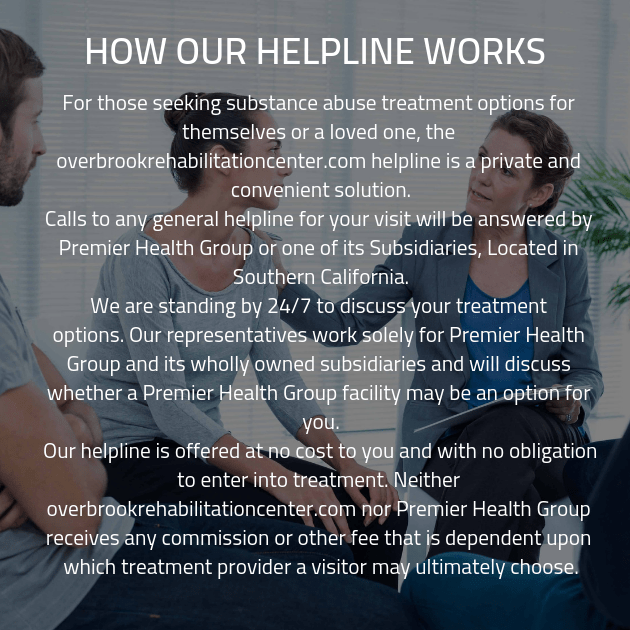 Overbrooke Rehabilitation Center is fiercely dedicated to helping our clients overcome their adversities with quality addiction implemented with superior guidance, support, and knowledge. Using a variety of methods, a personalized addiction recovery program is crafted by the client and their personal addiction counselor. This comprehensive plan takes into account everything about the client, including overall mental health. We believe, we know, that the key to treating addiction is to treat the whole person, not just the withdrawal symptoms. With the advantages of dual diagnosis mental health treatment, each person can get down to the root of their problems with thoughtful mental health treatment. Nearly half of all addictions concern an underlying and contributing mental illness. To recover from an addiction, both disorders must be addressed simultaneously. While you are in treatment you will learn how to avoid addiction triggers. When you go to leave, you will be set up with all the resources that will support and guide you in your sobriety. The esteemed, compassionate, and experienced addiction specialists will watch over and care for you while you are going through withdrawal symptoms. A supervised detox will allow you to be safe and comfortable. For the family member of a loved one with an addiction, we provide intervention services to effectively communicate the family’s concerns and do our best to get the person to enroll in treatment. We’re always here for you whenever you have a question, a concern, or simply just want to talk about your current situation. Don’t hesitate, call us today to find out what you need to succeed.